Standing on the steerage deck on a moonless night, 12-year-old Harry Shapiro already knew what it meant to be a man. A year shy of his bar mitzvah age, the boy had left his home in Bryztowitz, Poland to travel to America with his mother and three younger siblings. Anxious to see his father who had come to America four years earlier, he wondered what life would be like in a new land with a new language. They would reunite in a strange-sounding place called Portland, Connecticut. The year was 1900. The Shapiros were part of a sizeable wave of primarily Polish and Russian Jews who immigrated here between 1895 and 1920. Before this influx, Middletown was home to relatively few Jewish people. During the Revolutionary War era, Jewish residents included Isaac Solomons, an importer of goods, and Myer Myers, an investor in a local lead mine. But it was not until the 1870s that Jews began to arrive in significant numbers, largely from German and Austria-Hungary. Urban and middle-class, most did not stay, and within a decade were supplanted by the poorer and more rural Eastern European Jews, escaping pogroms and oppression in their homelands. Some of the earliest-arriving Eastern European Jews settled first in Portland, attracted to the work available at the Eastern Tinware Company, which actively recruited workers as they arrived at Ellis Island during the 1890s. A few, like Harry’s father, Joseph, became peddlers; others tailors and shoemakers. Their shul, or synagogue, was housed in a commercial building on Portland’s Main Street; Harry Shapiro celebrated his bar mitzvah there in 1902. Within a few years, Middletown’s thriving economy lured most of Portland’s Jews across the river. By 1905, a vibrant community of 80 families developed in the South End, where Jewish-owned grocery shops, bakeries and dry goods stores dotted Sumner, Union and South Streets. These families worshipped in private homes and in rented halls until 1908, when the growing community purchased a brick building on Union Street to house the newly incorporated Congregation Adath Israel. Recreating the shtetl life of the old country, these immigrants observed Orthodox Jewish traditions such as walking to the synagogue on the Sabbath, following kosher dietary laws, and establishing a mikvah, or bathhouse, where they could take ritual baths. The men attended shul to pray and study, while the women passed down traditions to the children just as they had done in Europe. By the 1920s, growing prosperity spurred an exodus from the South End. Families moved to William Street, businesses set up shop on Main Street, and the community produced its first doctors and lawyers. Americanized sons and daughters began to find employment outside of family businesses. In 1929, the synagogue, needing larger quarters, moved to Church and Broad Streets, prominently situated on South Green. Increasingly, members of the community grew active in Middletown’s civic organizations and political life. In 1945, to better reflect the changing sensibility of its membership, Congregation Adath Israel joined the Conservative movement. In 1896, Joseph Aaron Shapiro (1857-1927), husband of Sarah Slutzky Shapiro (1865-1952), left his native town of Bryztowitz, Poland for America, having been forced to close his tavern when the Czar decreed that only gentiles would be permitted to hold liquor licenses. Staked with $50, he set up a peddling business in Portland, selling fabric and notions door to door from a pack on his back. Eventually, he would open a shop under the name J.A. Shapiro on Sumner Street in Middletown’s South End. Sarah Slutzky Shapiro and her children stayed behind in Poland until her husband could establish himself in America. Four years after her husband emigrated, she and the children (from left to right: Sadie, Herman, Jacob and Harry, the oldest) traveled by ship to join him. Their steerage tickets cost $18 each. At Ellis Island, representatives from the Jewish Aid Society gave the children bananas to eat. Not knowing what they were, the youngsters threw the fruit in the water. With a traditional chupa (wedding canopy) over their heads, Jewish immigrants Harry Shapiro (1888-1983) and Rose Schwartzbuch (1889-1963) exchanged marriage vows in 1911. Theirs was one of the first weddings to take place at the newly founded Congregation Adath Israel, then located in a renovated two-family house on Union Street. As part of the orthodox tradition, the altar, or bima, was located in the center of the room, and during religious services women were seated in the balcony separate from the men on the main floor. In this tightly knit immigrant enclave, weddings were community affairs. Women would pitch in to cook and everyone would be invited. In 1920, Harry and Rose Shapiro, now established and successful, posed with their children, Sylvia, Muriel, Virginia and Nathan, in the back yard of their Hubbard Street home. 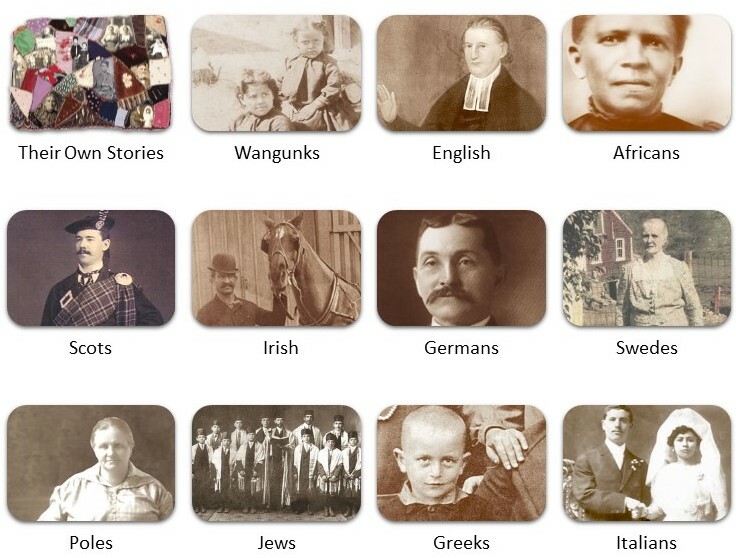 They, like many from the Jewish immigrant community during the ‘teens and twenties, left the South End as they prospered and became more Americanized. In the 1920s, J.A. Shapiro and Son, founded by Harry Shapiro in partnership with his father Joseph, was thriving in its location in the Mansion Block on Main Street (now Metro Square). A mainstay of Middletown retailing, the store, whose name changed to Shapiro’s, prospered at this site for more than 50 years. In 1975, it expanded into a department store when it moved into the vacated James H. Bunce Co. The store closed its doors in 1986. Pictured here is J.A. Shapiro and Son as it looked in 1922, with Harry Shapiro (left), salesman H. Atkins and Minnie Shapiro Grower. A boy’s religious education began at an early age with rigorous rote learning of Hebrew, taught by a melamed, or teacher of elementary Hebrew. Before the synagogue on Union Street was established, boys were taught singly or in small groups in their own homes. In 1908, the synagogue opened its doors to its first classes in the Torah and the Talmud. Although girls were allowed to attend, they were generally taught at home, where they learned the rituals of holiday observance and kosher dietary laws. In the synagogue, prayers and psalms are often sung rather than recited. 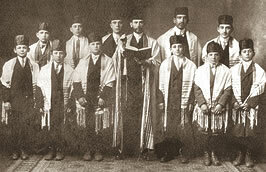 In this photograph from 1913, the rabbi led a choir of men and boys. Pictured here in the first row (l-r): Benny Levine, Isidore Rosenthal, Harry Frank, Rabbi Wiernikoff, —- Baum, Maurice Shapiro and Phillip Markowitz. Back row (l-r): —- Gordon, Isidore Mattes, —- Mittleman, unknown and —- Shapiro.